The kick-in-the-pants came from David Salaguinto, who writes about Visio for Office Online, and has a very interesting comic/blog called Office OFFline. 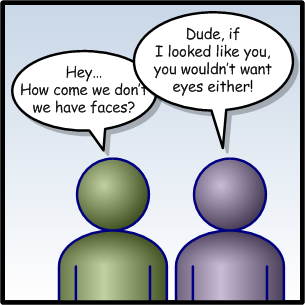 Office OFFline features software-themed comics, created entirely with Visio! 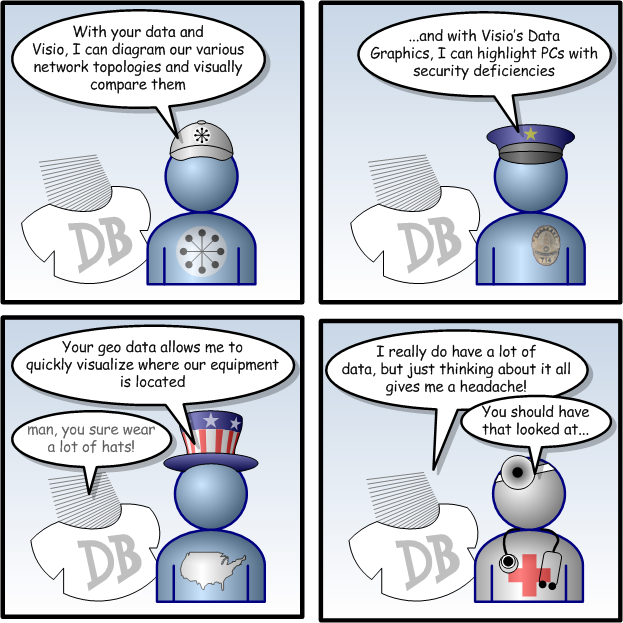 David wrote this very cool article: Office Hours: Drawing a daily comic strip with Visio, in which he talks about creating comics, using Visio to do it, having fun, and putting your emotions into a storyline. Golly Gee, Mr. Kent, Doesn’t Visio Already Have Word Balloons? Well, yes Jimmy, Visio does come with some word balloon shapes. They You’ll find them buried are located under: File > Shapes > Visio Extras > Callouts. But the shapes are either rectangular, or oval with a straight callout line.No soft-and-fuzzy comic-style word balloons here, folks. Move along! But if you want that genuine comic effect, you need an oval balloon, with a triangular tail, and you need to be able to move that tail in any direction. So over the last few weeks, I’ve been fiddling with the oval word balloon, and ways to calculate the opening where the callout meets the ellipse. After some truly horrifying iterations, filled with temporary Geometry sections, tens of User-defined cells, and extremely long ShapeSheet formulas,I finally came up with a “brilliant insight”, and was off to the races. The end result is what this article’s download offers: an easy to use, bona fide Word Balloon shape! The download also contains an improved version of the Person shape, which first debuted in: Free Visio People Shapes. The new Person behaves better with Visio 2007’s Theme-ing feature. Silly Rabbit, It’s Not Just Cartoons! Just because the shape is a comic-style word balloon doesn’t mean it is only intended for fun and games. While David’s comic/blog is humorous, there are also messages behind the strips that could be used by the marketing department. And in an article on Boxes and Arrows, Rebeka Sedaca talks about how her team uses comics in presentations to simplify complicated details, yet still get important messages across. Check out: Comics: Not just for laughs!. The article even has a Visio stencil for download that includes generic, office-related comic scenes to which you can add your own word balloons. Download the Word Balloon…Faster Than a Speeding Bullet! Great looking shape, can I put this in one of my own stencils? I have Visio application to design/document/deploy Messaging Infrastructures based on IBM WebSphere MQ and it’s called MQArchitect. 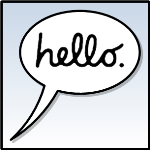 Yes, you can put the Word Balloon in your stencil. But could you first download the latest version? I put some hyperlinks to this article and the home page of Visio Guy in the right-click menu. Great! But sometimes things are better left unsaid, even in comics. So how about a Word Ballon Shape 2.0 with additional ‘thinking bubbles’ just to make it perfect? Maybe you’ll create a Thought Balloon and submit it? Thanks for the new shape. The Comic Sans links were interesting since I tend to use that as my default font. Glad you could use the shapes! GREAT — thanks Visio Guy! I use your bubble for patent drawings! Thanks for chiming in and letting us know what you do with these shapes. Patent drawings, cool! Great smart shape!! 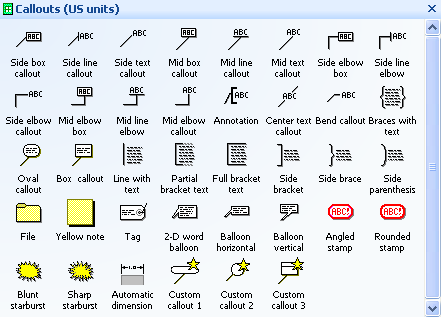 I know its all about Visio here but is it possible to use this call out in word -sort of add to its auto shape stencil? its become an authentic comic software!! You can certainly copy from Visio and paste into Word, but you won’t have that “liveness” that an autoshape has. If you paste to Word, then set layout to “Tight” or “In front of text”, it works pretty well. Plus, you can double-click the Word Balloon to edit “in-place”. 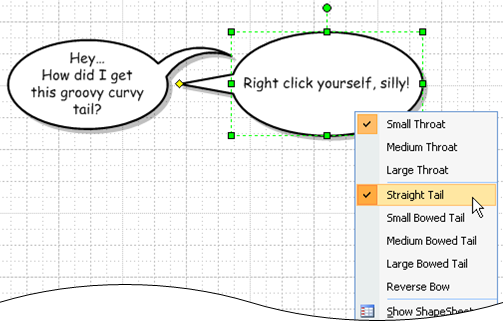 This opens the Word Balloon in a mini, in-place Visio window, where you can change the text, move the balloon’s tail, etc. Hi Chris. I’d like to use these shapes as background art in a small jokebook app for Windows Phone 7. It’s a fully free app (no ads). The app is really just a way for me to try out Windows Phone development and try a Marketplace submission. Is this shape use OK with you? I’ll add you to the credits on the About page of the app of course.